The first UK Innovation Pioneers tank event brought together a diverse group of participants from corporates, scale-ups and young people. The challenge we set for the day was: How can we create a culture of innovation? Participants from BT, Tesco, Santander and the Ministry of Justice convened with Innovation Pioneers initiator organisations Wazoku, Freeformers and Abellio Greater Anglia at the Greater Anglia Academy in Stratford and spent the morning getting stuck into the what, how and why of creating a culture of innovation. 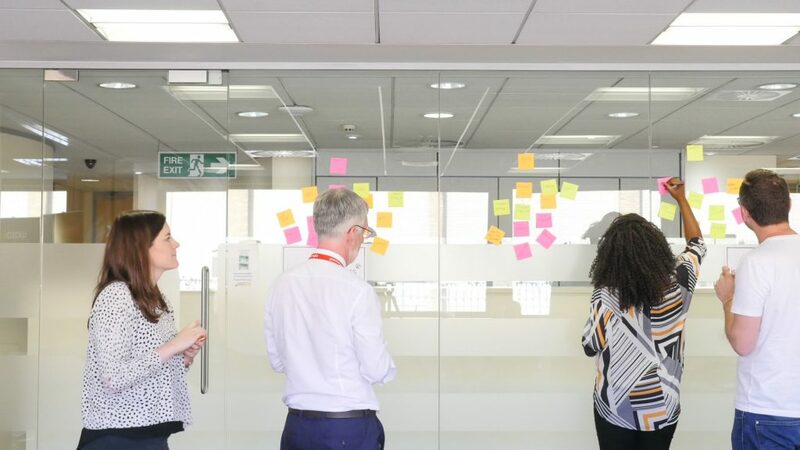 We’ve boiled down the inspiring discussion, divergent and convergent thinking, multiple post-it notes and rapid prototyping into seven steps that can help you create a culture of innovation within your organisation. I wonder how they learn from mistakes to get to the right solution and learn from failure? Create personas – applying your ‘I know, I wonder’ problem statements to an individual makes it more defined, helps add focus to solutions and marks a shift to more user-centric thinking. Each group created a persona based on either middle management, frontline staff or someone yet to join the company and used the characteristics of that persona to consider the problem from a different and specific viewpoint. Map your user journey – set out a journey (two, four or six months work well) and highlight the important milestones where you’ll be required to convince your persona to actively build and contribute to a culture of innovation. What are the pains and gains this individual is likely to experience within a particular time period? For example for someone yet to join the company what does their first three months look like, from interviewing to joining the company to their first few weeks in the role and when might they face challenges. That way you have tackled the pain points and come up with a solution before the problem arises. No idea is a bad idea – when digging into the solution ie. what are you actually going to do to attract talent with the right mindset? Keep your ideas and suggestions as divergent and broad as possible – sometimes the least conventional solution can be the most effective and applying an idea from another context to your own challenge can open up opportunities. Refine the best ideas – apply dotmocracy to identify the most relevant solutions, then summarise them on a single sheet of a flip chart so they can be communicated concisely and clearly. Develop your experiment – our group developed their ideas and then presented them back to the group in 90 second pitches, but your final experiment might be testing a collaborative tool, inviting feedback on your ideas from end users or running an ideation session in a different way. With these seven simple steps you can achieve something that might take weeks of conversations in a morning, when you use appropropriate tools and it’s facilitated in a structured way. So if you are doing it for yourself remember choose a structure and stick to it, be militant with your timings and focus on having a real tangible output that you can test at the end of the day. Innovation Pioneers is a network for innovators, by innovators. Initiating companies from a mix of public and private sector organisations run our network on behalf of our members. Initiators and members are a mix of corporate, SME and Scale-up organisations, who’s shared vision is to build innovation capabilities through joint development, creating effectiveness, performance and growth in our member firms and broader society.